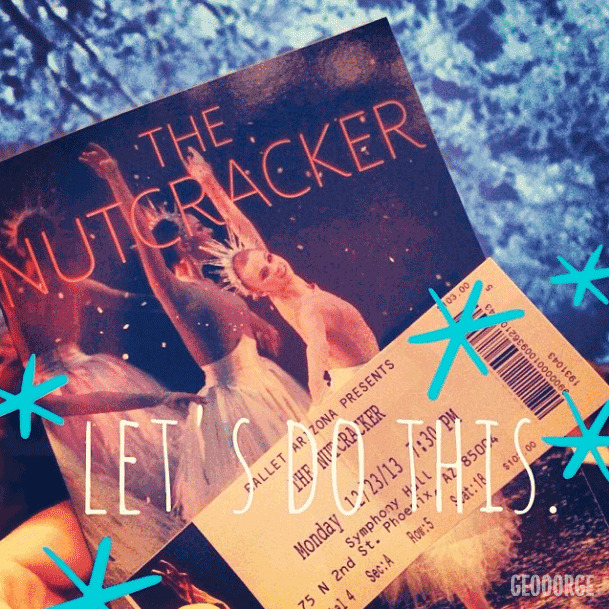 I didn't plan on going to the Nutcracker last night. Originally, I was supposed to go to the ballet with April and Stuart. One night about a month ago, April is trying and pushing to get me to purchase tickets. I finally gave in after getting an email from Ballet AZ saying the Nutcracker is 50% off the same night April wants me to go. I ask her where they are sitting, Section C she tells me. I keep looking and looking for Section C in Symphony Hall, can't find it. I see section 1, 2 and 3 . . . but no letters. Finally, I think she's just sleep deprived and telling me things because it's about 3AM at this point. I go ahead and purchase tickets close to Section 3. For me, I think C, 3 . . . same thing. I get to work the next morning, tell her I got tickets and she asked me where I am sitting. I tell her and she's really confused. We go back and forth for a minute and something just isn't sitting well with me. I then proceed to ask her what ballet she's going to. THE RUSSIAN BALLET! Why she didn't tell me or I didn't ask is completely beyond me. We bought tickets to two completely different ballets. Who knew Phoenix was that culturally down to have two ballets. In the end it worked out because of our ADDY extension I ended up at Mingle Bells the night we were supposed to go and I moved my ticket to last night. The ballet I went to was incredibly funny and beautifully performed. The sugar plum fairy and man fairy were spectacular. Their lines, jumps and turns were on lock. There was a point in the ballet where their duo was so spectacularly executed I thought the audience was going to give them a standing ovation in the middle of the show. Then there is this Queen of Hearts character that is totally a Drag Queen. AMAZING. That's all. It was cool seeing and recognizing some of the dancers from Cinderella in their new rolls. If you have the chance to go and see the ballet, you should go. I highly recommend them.